Set the stage for the bride and groom at the ceremony or reception by creating a backdrop with tulle. 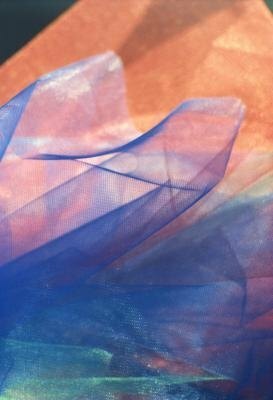 Tulle is an inexpensive, lightweight fabric that is available in a variety of colors to complement any wedding décor. When creating a backdrop, take into account the size of the area as well as the availability of electricity in the area. Check with the reception hall management or the church before hanging anything on the walls or ceiling. Measure the height and width of the area you want to cover. Multiply the height by two and add this number to the width to get the length of fabric you need to create a tulle frame. Add 15 percent of the total length for each swag you want to create. For example, the ceiling height is 10 feet and the width of the platform for the head table is 20 feet. The total length of the fabric would be 40 feet. For one swag, add an additional 6 feet. For three swags, add 18 feet for a total length of 58 feet. Add an additional 4 feet if you want the tulle to puddle on the floor. Work with a single length of fabric measured according to the steps above. Start with one end of the fabric just touching the floor or puddling according to your tastes and measurements. Stretch the fabric to the ceiling. Wrap ribbon around the tulle where you want to secure the tulle to the wall. Press a thumbtack through the back of the ribbon into the wall. Repeat the process for the beginning and end or each swag. Let the remainder of the fabric fall to the floor once you have reached the edge of the area you want to define. Fluff the swags so that they lay in clean pleats. Use an individual curtain rod or dowel rod for each panel of tulle. Attach curtain rod holders to the wall using thumbtacks. Hang the curtain rods and panels. Place white mini-light strings behind the tulle patterns. Use icicle lights at the top of the tulle and leave the rest of the area unlighted to create a valance. Hang strings of lights in zigzag or curly patterns to add interest. Measure the height of the ceiling and multiply by three. Sew a zigzag pattern across the width of the tulle using fishing line. Start at one edge and sew at a 90-degree angle across the panel using a long, basting stitch. When you reach the opposite side of the fabric, turn and work at a 90-degree angle back across the fabric. Continue down the whole length of the fabric. Do not tie off the fishing line. Start at the top of the fabric and press the fabric upward along the fishing line to create bunches. Work down the entire length of the fabric. Hang panels on individual curtain rods and hang using curtain holders and thumbtacks.